Blazing your trail around Kellogg Community College’s North Avenue campus in Battle Creek just got a whole lot easier thanks to today’s installation of an official B-cycle station in the parking lot of the College’s Lane-Thomas Building. The B-cycle bike-sharing system lets riders check bicycles out and return them at any one of three locations in Battle Creek, including KCC’s station and stations located near Burnham Brook Community Center and Riverwalk Centre downtown. A 24-hour B-cycle pass can be purchased onsite at B-cycle stations or online at https://battlecreek.bcycle.com for $5, while 30-day memberships are available for purchase online for $15 ($10 for students) and annual memberships are available for purchase online for $30 ($20 for students). 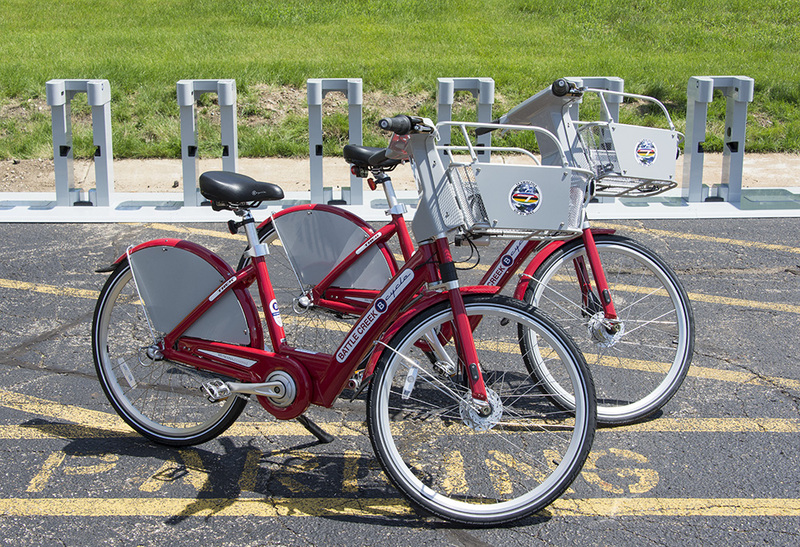 See the new bikes now on the south side of KCC’s North Avenue campus in the Lane-Thomas parking lot or visit https://battlecreek.bcycle.com for more information or to sign up for a membership. Try one out today and let us know what you think!